The current television advertisement from energy suppliers, npower, shows a clear commitment to their Plain English Campaign corporate membership. Promoting their latest Crystal Mark for clearer bills, the new campaign responds to the consumers' call for clearer bills. This morning our press officer, Marie Clair, was asked by BBC Essex radio to comment on the article about a charity, Disability Essex, that has terminated its contract with a government department because of the resources involved in submitting 4,500 pages of information as part of the monitoring process required by the government contractor. Our Government have set up the Big Society Deregulation Taskforce (BSDT) in a positive effort to investigate unnecessary bureaucracy. Plain English Campaign are willing to help by offering our services based on our past experience during the Rayner Review of 1983, that worked successfully to reduce unnecessary paperwork in government. National Plain English Day falls on Friday 10 December 2010 and will coincide with the Plain English Campaign's annual Golden Bull awards. Message from Marie Clair, press officer at Plain English Campaign. Thank you to everyone who has contacted the office to let us know, or complain about, the grammatical errors in my recent quotes published online and in the press this week. The quotes related to the school teacher whose unfortunate, and numerous, email errors were sent to me for comment by a news agency. The teacher's email is a reminder to us that communications made in a hurry can contain mistakes. In many jobs where communication is a major part of the job, deadlines and a heavy workload can leave little time for preparation and proof-reading. The printed errors of my quote are a reminder that verbal information is more likely to be misinterpreted. The spoken word doesn't have punctuation, good spelling and proper grammar to accurately communicate meaning. We all make mistakes, but we have a responsibility to communicate clearly, by using a spell-checker before we send our emails, or by providing only written comments to the press. It's reassuring to know that there are people who care about using the English language properly. I will 'try harder', as my old school reports often suggested. I hope I don't make as many mistakes in one email as the now infamous teacher, but if we set ourselves as examples then we must accept any justified criticism with good grace and learn from it. Please carry-on complaining to all those that use jargon and poor communications, including me. Everyone has a right to crystal-clear information that they can understand first time round. A University of Derby online application form has been recognised for its straightforward style with a Crystal Mark. It is the first form of its kind to be recognised by the Plain English Campaign in this way. The Plain English Campaign gives the award with their distinctive Crystal Mark logo to documents and websites that provide information clearly, with the best use of English and correct use of punctuation and grammar. Parking notices are frequently named by drivers as a serious irritation. Misreading a parking sign can lead to a hefty fine, particularly if the penalty notice is also unclear. Plain English Campaign feel it is time to apply plain English to everything connected with parking to make life easier and less costly for all involved. Councils have to invest in managing parking to please businesses, residents and drivers. Due to the number of emails we have received, there is no doubt that parking is a sensitive subject for drivers. Whether it’s the signs, the lines, or the fines – parking creates nothing but whines. Traffic wardens have to cope first hand with the negative response to their attempts at managing the growing number of vehicles on our roads. Meanwhile, drivers struggle with the looming threat of a parking fine. Richmond Borough Council has tried to tackle the problem by introducing a ‘humane parking’ scheme, which in reality is little more than an attempt to introduce a ‘reasonable parking’ scheme. Sadly, the name itself left many drivers puzzled by the use of such language. 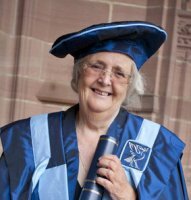 Chrissie with her honorary fellowship at the Liverpool John Moores University graduation ceremony. 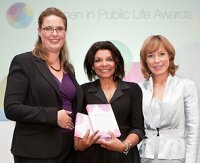 Marie Clair accepts the Women in Public Life awards on behalf of Chrissie Maher. Award ceremony host, BBC News presenter Sian Williams is right, and Sam Walker, from Scottish Widows, left. The Plain English campaign has proved it has staying power after its founder scooped a top gong at the Women in Public Life Awards. Chrissie Maher OBE, from the organisation based in New Mills, was named winner in the public affairs category at a glitzy ceremony at the Northumberland Hotel, London. Nanny McPhee - bull or champion? The annual awards are coming and the jargon is pouring in - particularly a number of nominations for Emma Thompson, the actress, who recently spoke out against the sloppy language of teenagers. You can read a report of her comments in the Mail Online. It must be the first time that the same person and the same comment has been nominated for both the good and bad categories of our awards. And that divided public opinion is reflected within the campaign's offices. Read more: Nanny McPhee - bull or champion?